Most tourists who have been to Cape Town know the well-trodden Garden Route from Cape Town to Port Elizabeth, with its share of beautiful sea vistas, stunning mountains…and the attendant crowds. But the No Crowds aficionado will want to sample a parallel, inland route, known locally as “the 62” after the main highway it follows. The road winds through the Klein Karoo, a vast scrubland with the beauty and desolation of the badlands of the American west. It’s only the elands, impala and occasional complaining wildebeest that remind you that you are somewhere on the other side of the world by latitude as well as longitude. Some 250 km along the route from Cape Town you will find Matjiesfontein (pronounced Mikeys-fontayn), a don’t-blink-or-you’ll-miss-it whistle stop, population 300. The town is literally in the middle of nowhere, with nary a settlement within 50 km either way. Started in 1884 as a rather unlikely spa by Jimmy Logan, a young Scot who came to work on the railroad, it housed a garrison of British soldiers for a time, but is today a perfectly preserved (actually rebuilt) Victorian town. Every building up and down the main (and more or less only) street is a perfectly restored period piece. The lovely Lord Milner Hotel with its dark wood, brass fittings and old portraits will convince you that you stepped out of a time machine 100 years ago. The impression will be reinforced as you walk into the back garden, with its bowling lawn, lily pond and (slightly anachronistic) massage tables under a tree filled with calming crystal amulets and weaverbird nests. A classic London Routemaster bus doesn’t quite fit the fin du siècle charm, but is available to transport people from one end of town to the other (walking time: 5 minutes). The real treasure of Matjiesfontein, however, is a guy named John, who, like his father before him, has worked all his life in the town. A self-described “tour guide, bartender, sweeper and musician”, John led us through Jimmy Logan’s carefully preserved suite at the Lord Milner and through the gardens over to the Laird’s Arms, which can only be described as a wild west saloon. 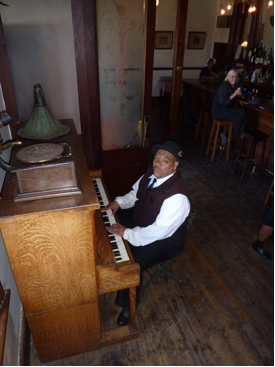 No sooner had the barkeep pulled our Castle Lagers than John sat down at the player piano, switched it to manual, and jammed his way through Fats Domino’s “Blueberry Hill” and any number of blues classics. Like Sam in “Casablanca”, he’s the real deal, and as much a fixture as the plate glass mirrors behind the bar. Next time we pass by Matjiesfontein, we’ll ask him if he can play that song the way Sam did, at the other end of this vast continent. Because in Matjiesfontein, I’m not at all sure that time goes by.